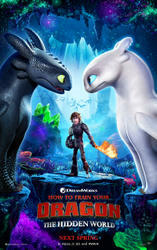 Buy tickets to an exclusive early screening of 'How to Train Your Dragon: The Hidden World'! Available now! Jay Baruchel, America Ferrera, and director Dean DeBlois reminisce over 10 years of 'How to Train Your Dragon' adventures together and reveal a few easter eggs to look out for in 'How to Train Your Dragon: The Hidden World'! Looking for movie tickets? Enter your location to see which movie theaters are playing Fandango Early Access: How to Train Your Dragon: The Hidden World near you.